A girl’s gotta be cute even while sleeping! This loungewear set includes a sweet shirt with yoke back detail, gathered, dropped shoulder seams, cap sleeves and shirt tail hem. 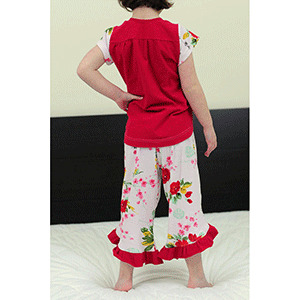 Also included are capris and shorts with a ruffled curved hem and optional faux drawstring. 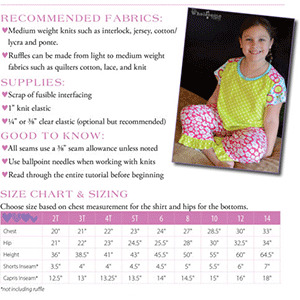 This pattern is available in sizes 2T to 14. Suggested fabrics are cotton lycra, ponte de roma or cotton jersey.